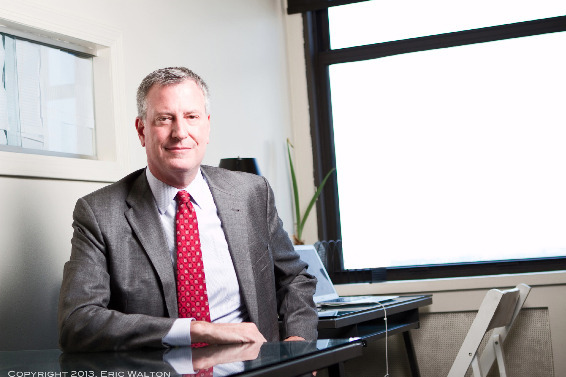 On June 21st, I met with New York City Public Advocate and mayoral candidate Bill de Blasio at his campaign headquarters in downtown Brooklyn to discuss Stop and Frisk, horse carriage rides, fracking, healthcare, and New York's energy future. Eric Walton: As Public Advocate and as a mayoral candidate, you've been a very outspoken opponent of the NYPD's Stop & Frisk program. Why do you want to reform Stop & Frisk and as mayor of New York City, what would you do to ensure that the civil liberties of all New Yorkers were protected? Bill de Blasio: I start from the assumption that it is our responsibility as leaders to protect civil liberties and protect public safety simultaneously. I always say that the country is founded on that concept, and yet, in the public debate in New York City you constantly hear, including from the mayor and the police commissioner, a kind of diminution of anyone who suggests that problems of civil liberty are meaningful. They try to create the image that if you care about civil liberties, if you care about police/community relations, somehow you care less about safety and I reject that entirely. I think it's a smokescreen. The fact is, the best path forward in New York City is to mend police/community relations in communities of color. And the NYPD has had some unfortunate history in terms of not following Constitutional guidelines and not just with Stop and Frisk, but with the 2004 Republican Convention, which is a legendary example. It's crucial that we turn that page, that we put in place the safeguards to once and for all ensure that the NYPD acts in a Constitutional manner. I think that will increase public confidence in the police, increase public communication with the police at the neighborhood level and create the real atmosphere of partnership and I think it will make us safer. But to do all of that we need a new police commissioner, because [police commissioner Ray] Kelley is not going to fundamentally change Stop and Frisk; he is the author of the overuse of Stop and Frisk. We need an inspector general and we need a racial profiling bill. EW: One of the biggest issues in New York State right now is fracking. And the controversial Spectra Pipeline in the West Village is set to bring methane gas obtained through fracking into New York City in November. What are your positions on fracking and the Spectra, Constitution, and Rockaway Pipelines? BDB: I believe strongly in the moratorium on fracking. I think it is abundantly clear that the technology is far from perfected. There are incredible dangers associated with fracking that could have a lasting impact on our water supply in particular, beyond just the city water shed, but anywhere it's being done. And so I think the moratorium is necessary and I don't think the moratorium should be lifted until these issues are resolved, if they are ever resolved. We are increasingly learning about the impact of the gas obtained from fracking in terms of health. And I certainly have my own concerns. I haven't studied it exhaustively, but I can tell you that the things I've heard about what the gas itself includes in terms of its composition gives me real concerns about its impacts on public health. If it were delivered to the city, the radon, for example could have real negative public health impacts that we haven't had previously from natural gas. And I'm also broadly worried about the safety of any pipeline. We've had some instances that certainly justify real concern about having a pipeline in an urban area. We have a pollution problem in this city, too. Some of our buildings, however, use fuels that are dirtier than natural gas, so on that point natural gas has some advantages over certain other fuels, but I'm very concerned about the pipelines themselves and I'm very concerned about the composition of this new fracking gas. EW: What is your vision for New York City's energy future? BDB: In terms of energy for New York City, the things that excite me the most going forward are wide-scale building retrofits and solar energy. In terms of lowering emissions, buildings are the central concern and we are empowered in this city by the fact that we have the largest stock of public buildings anywhere in the country. I have suggested we emulate a plan currently being used in Chicago that provides a financing mechanism to retrofit both public and private buildings, and it's a viable approach because the expenses of retrofitting can be repaid through greater energy efficiency. The program would also provide jobs for many New Yorkers who are currently unemployed, which would marry the notion of environmental sustainability with economic sustainability. So, that's one thing I would want to focus on and another is solar. By increasing our solar energy capacity, we have the opportunity not only to reduce emissions, which is a tremendous benefit to public health, but also the more solar capacity we implement, the more energy-independent we become in the event of a storm like Sandy, which really disrupted the city's energy supply. So, I think we have an amazing opportunity to expand New York City's solar capacity and I'm hoping the solar bill passes in the state senate and if it doesn't, it would be a major priority for me to get it passed. EW: I attended the New York City Mayoral Forum on Animal Rights in May and was impressed that you were (and I believe still are) the only mayoral candidate in this race who has taken an unequivocal stand against horse carriage rides. I believe you also mentioned at that forum that both of your children are vegetarians. Could you briefly explain your views on animal rights and tell me why the issue of horse carriage rides is so central to your campaign? BDB: Of course. I'd like to take a moment to comment on my children, as I am incredibly proud of them. One of the things we aspire to do as conscientious parents is to equip our children with critical thinking skills and we now have two very critical thinkers who both became vegetarians on their own and independently of each other. And they did it because they decided that for the future of the Earth, this was a better way. And I'm very proud of the way they thought as citizens and as well as individuals. In terms of horse carriage rides, I began with this sort of romantic notion of the horse carriages as a part of New York's heritage and culture, but then I started to learn about it and I was appalled. And I think that's true for a lot of people. The minute you get them to think about it, the inappropriateness of it just jumps off the page. These are animals that should be in nature, and instead they're on pavement and in traffic. So the more I learned, the more I became convinced that this has to end and it has to end now. The electric, antique car program could provide employment for those who currently make their living in the horse carriage industry, but we need a ban on horse carriage rides right away. The notion that we're being inhumane to animals as a matter of public policy is absolutely unacceptable to me. EW: According to a study published last year in the Annals of Family Medicine, the average cost of healthcare insurance for American families will surpass the average family income by the year 2033. Healthcare insurance is already beyond the means of many people in this city. How would your recently unveiled healthcare plan make medical treatment more accessible to New Yorkers who can't afford health insurance? BDB: What we want to do is take full advantage of the Affordable Care Act, which depends on people being signed up for exchanges and the city can play an important role in making that happen. So, the first thing would be to make sure people who don't have health insurance are signed up for the Affordable Care Act and the second thing is to create more clinic capacity at the local level in neighborhoods that are under-served and get people into the habits of preventative and primary care, which of course borrows from the whole concept of Obamacare, which is to focus our energies on the front end of the process, instead of what we're doing right now, where so many people get sick, get sicker, and then end up in the emergency room. And in terms of public sector workers, I'd like to emulate a model that the Hotel Trades Council unions use, which is to create a unified health center for key public employment sites. These centers would focus on the wellness of the whole individual, which is not only better for people's health, but also much more cost efficient. There's such a center in Harlem that is amazing. It has the different core medical services that people need all under one roof. You walk out of your appointment with your doctor with a prescription in your hand and you go down one floor to get it filled. It's all about making sure people are actually following through on the things that will keep them healthy and I want to adopt that as a public model for own employees. I think it will be better for their health and also save us a lot tax-payer dollars in the long run. EW: What do you think is an important issue for the residents of Hell's Kitchen? BDB: Affordable housing. This is one of those areas in New York City where people have been really priced out. There are lots of neighborhoods in the city where that's the case, but Hell's Kitchen is one of the most salient examples of people feeling the pressures of gentrification and development and being forced out of a neighborhood that they love and want to be a part of. I have a plan that would create 200,000 affordable housing units in New York City over ten years and we also have to ensure that promises made by the city government are kept and surpassed. An abridged version of this interview originally ran in the August issue of Inside Hell's Kitchen magazine.